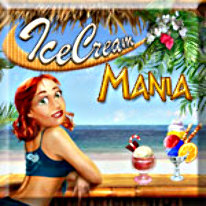 We all scream for Ice Cream...Mania! The will of ice cream mogul Henry Rich had just been read, and his vast fortune is to be divided between his two daughters: hard-working Cindy and greedy, lazy Jeanne. The daughter who builds the most profitable business over the course of a year will inherit Henry Rich's ice cream empire and entire fortune! Help Cindy to win the competition and become the next magnate of the Ice Cream Empire!